neorînduiala envisioned generating ideas for reorganising the garden of the Ion Andreescu University of Art and Design’s building ensemble at the perifery of Cluj, Romania. By proposing to clean and empty it’s spaces outside of the building, it is focusing on creating places that facilitate social cohesion. The school is (should be) a meeting place for intense and informal interaction, besides its purpose of academic formation. The 'red building', where the project was developed is home to the department of fashion, textile, ceramic, glass and sculpture, offering workplaces for more than 300 students. The wordplay used for naming the project contains two notions between which the program was manoeuvered and from where the wide/comprehensive concept has resulted. ○ neorânduială as :: „ s. f. agitation, revolt, insurrection; (act that constitutes a) breaking of law, disorder, abuse ”. Every single event, action, act, gesture, be it provocative, ironic, didactic or conceptual that had been undertaken during this diploma project, aimed to shake the student and personnel community, encouraging to open up dialogue between students and professors about the academic space. These intentions are joined by the idea of empowering the students to build and maintain their own space of activities, through raising consciousness of the responsibilities, which come packed along the statute of the student. The project started out on a very simple logical thread; the topic of the third semester of master studies at the department of sculpture had been to develop a plan for an intervention in public space. 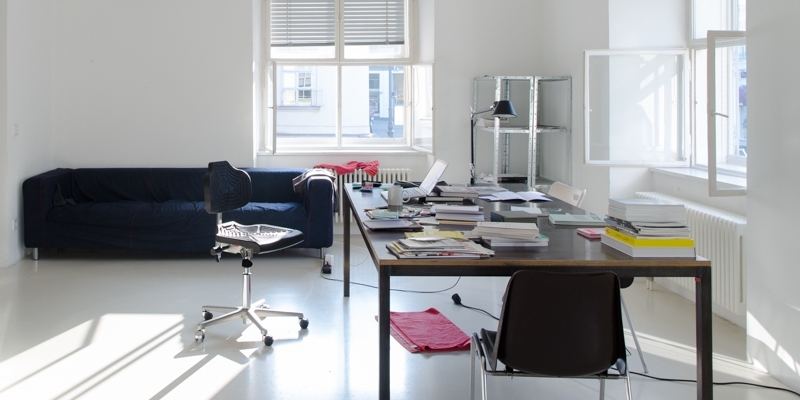 Since the academic institution has the status of a public institution, the obvious conclusion was that it also posesses public spaces open to anyone. - Since most of the university's unnecessary furniture lands in a fully packed storage space just behind the sculpture department, we (the students) could have used those as working material...or, as an incentive, the professors could have handed out a topic where the requirement would have been to use these stored materials. With a bit of dedication, this concept (of reusing, refurbishing, rethinking, etc) could have been fit into the academic curriculum. 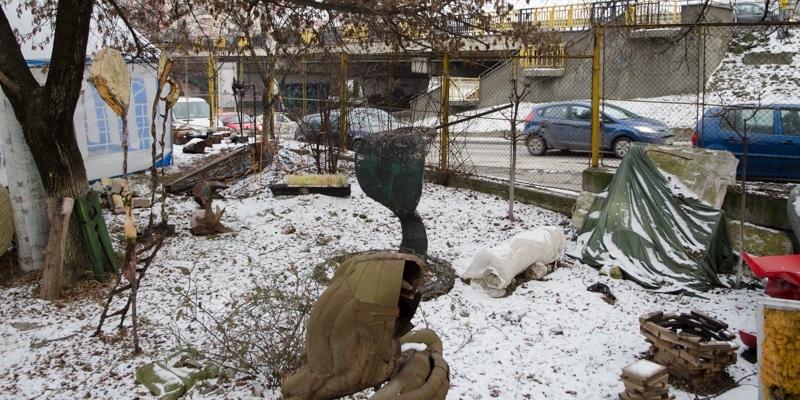 - Once the storage space got "liberated", the rusty, deteriorated or unwanted sculptures could have been deposited in safety. - Since the initial idea was to build a platform and to organise a series of events on it, the stored wooden and metal material would have been perfect for such a construction. A win-win situation, that did not succeed. 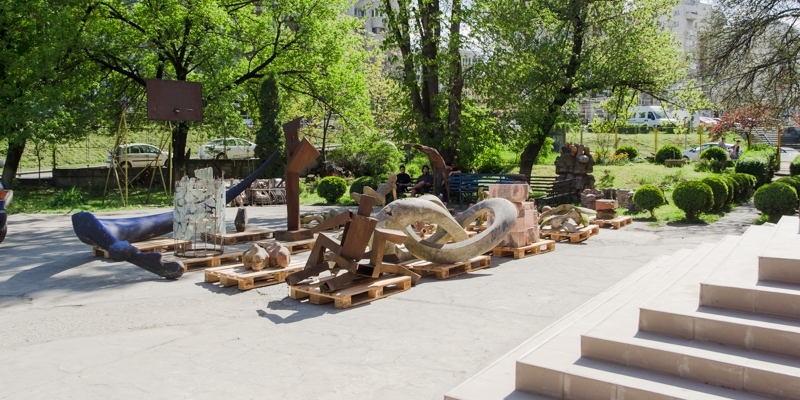 It was also around this time, that my supervising professor had expressed during an informal talk, that he would also like throw away all those sculptures in the garden. This remark had been noted and encouraged me later on. 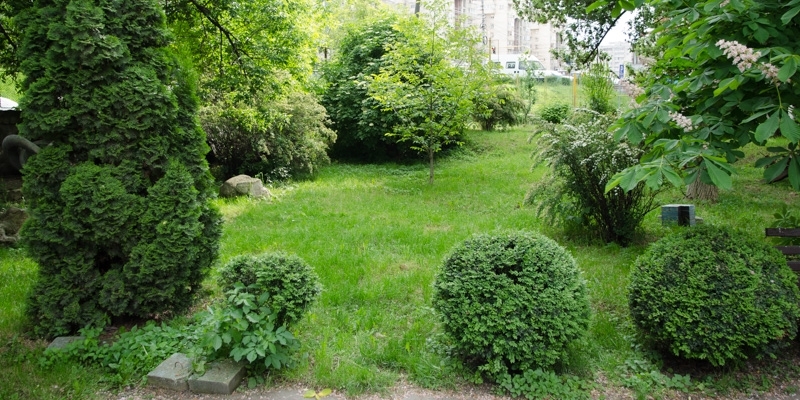 photo: the backyard of the university garden. 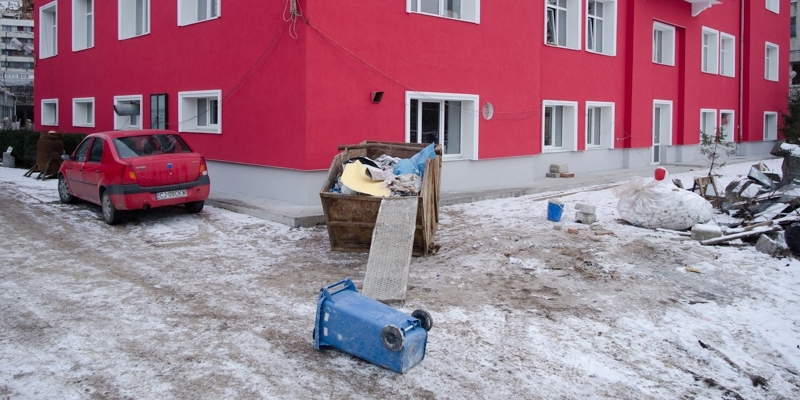 The photo was taken while there was construction work on the building. Anyways, even after it was cleared out, it quickly filled up again. 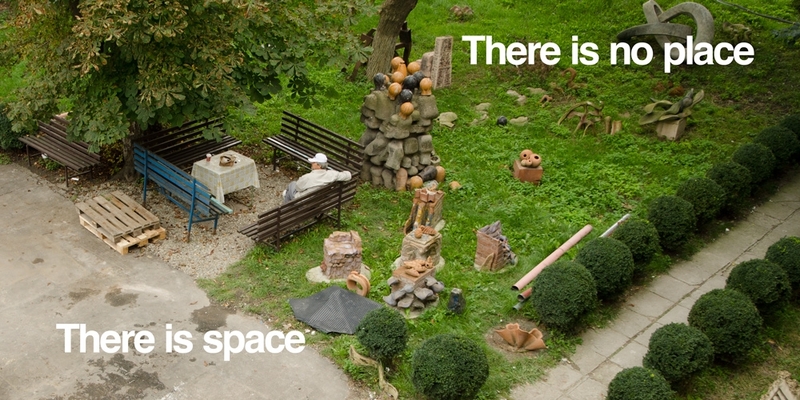 photo: space in front of the sculpture department. photo: space at the entrance of the university. photo: space near the "red building" and the parking lot. 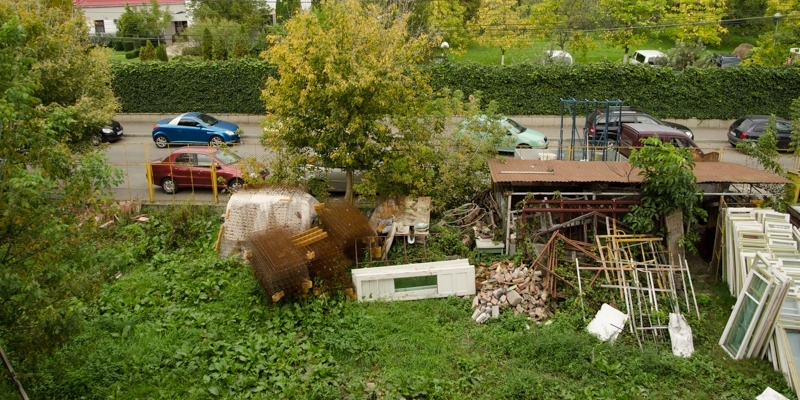 photo: green space across the "red building". Around the beginning of November 2015, the aforementioned committee proposed me to change the initial idea (that of the platform and series of events) and suggested to truly engage the students. The committee encouraged me to ask the students and if coherent plans emerge from a series of consultations, to convince the students to get involved in realising it. I was also suggested to enter the students' association and to work also from the inside of that organisation...a proposal I refused, being familiar with the fact that they have other priorities and a newcomer in such a hierarchical infrastructure is simply ignored. Besides, I was specifically interested to work from a simple student's position. Agreeing to change the initial plan, a leaflet containing photos of the garden, a satirical poem, several general suggestions and a page for collecting signatures was made and taken around and presented to every single class in the university. Approximately 50% of the students who attend that compound signed (the other 50% starts working in the university towards the end of the semester). On 25. 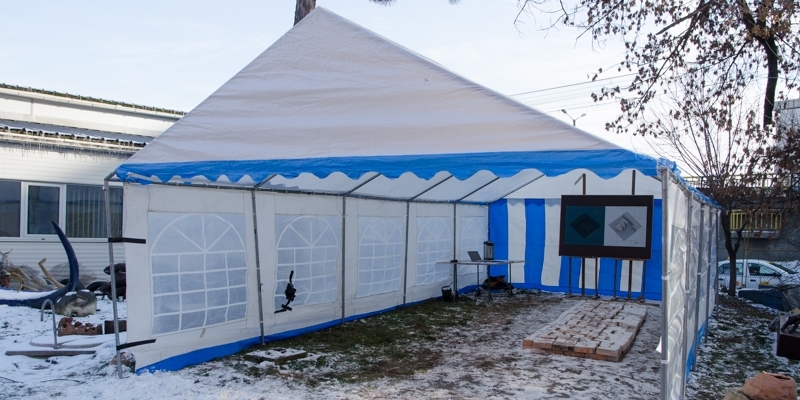 January 2016, a tent [ resembling those of recent protests ] was mounted in the courtyard and an infokiosk was opened under it’s protection. 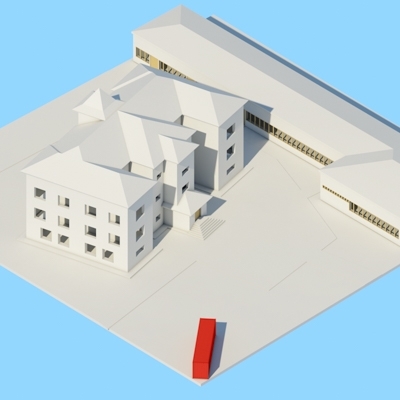 During that week, a 3D render of the ensemble was displayed on which students could mark those pressure points of the infrastructure, where the necessity of rearrangements was most acute. Along with hot tea and some drawing benches, the sketching of the most reasonable or wild suggestions and desires concerning the order or disorder of the garden was encouraged. In the course of a week these sketches have been made. Not many, but still something. 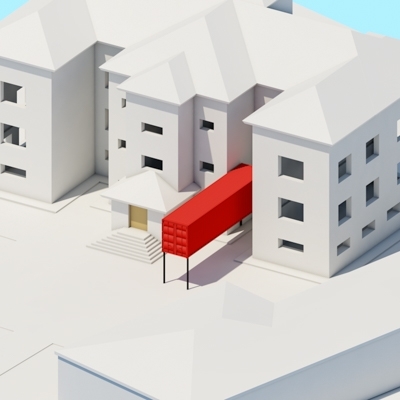 This call for applications had been launched several days after the Infokiosk, an event where spaces in need of cleaning, rearrangements and reclaiming were outlined. by them had been presented and distributed at the departments. 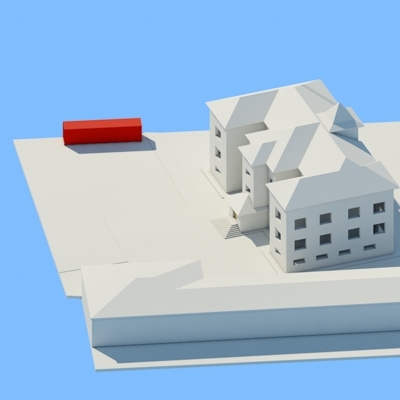 Deadline was not set and unfortunately, no further sketches or concrete plans had been received. a few diploma works had been taken away but not much has changed. 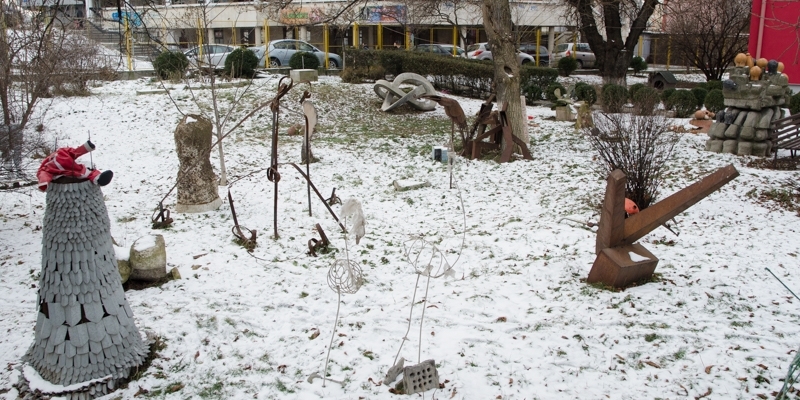 The garden is entirely occupied by the works of the young sculptors. It is quite ironic, but a while after the infokiosk had ended, I found out, that a teacher from the department of ceramic design (two departments apparently in conflict at the time) told its students not to visit the tent and not to engage in the project since the sculptors are managing business in the garden anyways (also referring to the dropping like style of sculptures around the garden). Which is true, but unfortunately an important point had been missed by the professor...one of the project's aim was to clear the garden of these works and to create new places that are somewhat planned in a way which would allow the placement of either ceramic or other types of art. 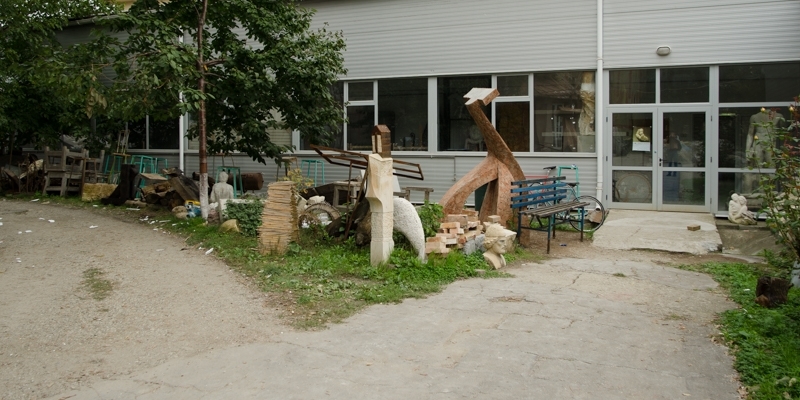 photo: the entrance of the sculpture department. It is usually this crowded right before the semester exhibition. In March 2016, I started developing the stub of a blog that had been created for the neorînduială project into a proper website. Also at that time, I started mapping out artistic interventions in public spaces in Romania and the Republic of Moldova. A list of books had been compiled along with a list of links, that contain a much wider spectrum of interventions. 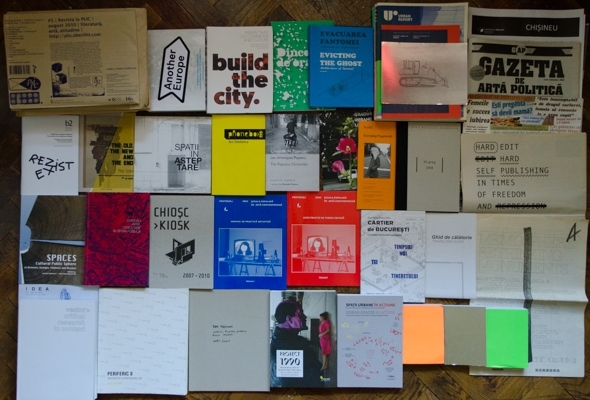 Collecting these publications was important because it provided a sort of proof for my supervising professors, that the project I was doing had antecedents, provocation is not an act of the devil and, in a way, it is related to art. 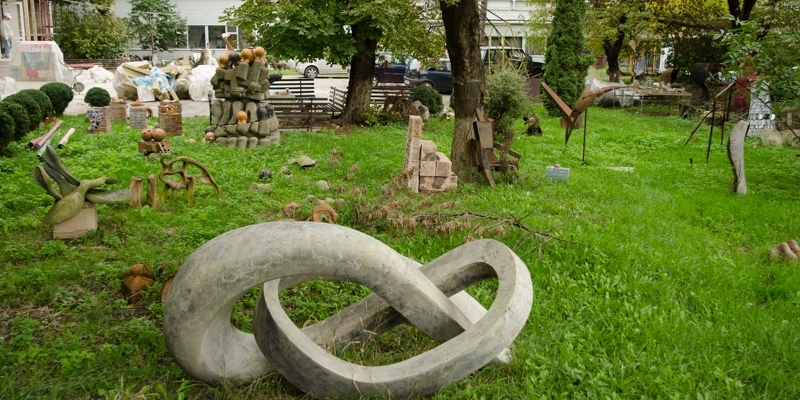 The project was dealing after all with space, an intrinsic aspect of every type of sculpture. 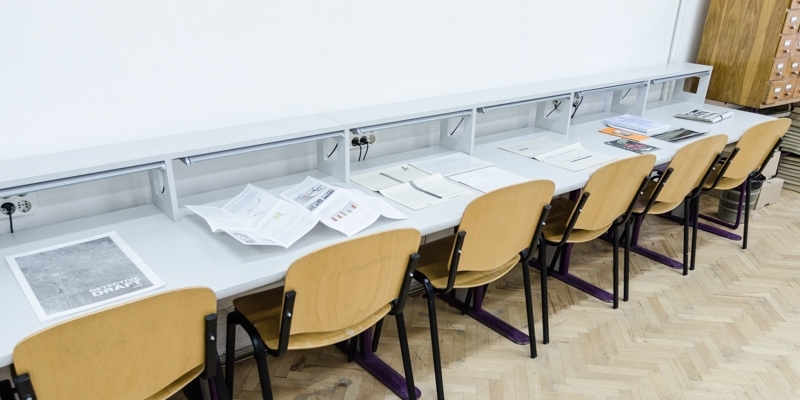 However, reevaluating the whole process of neorînduială, the outcome would have looked more honest and professional if I would have had presented it right from the beginning as a cultural political agenda, that simply aspires for a better working environment and community life in the university. At the residency, I also started working on a proper website which would have been collecting these interventions, but lack of technical knowledge was an obstacle I could not get passed by. The wish to do it at some point still exists, so if anyone is interested to collaborate drop me a message, I am more than happy to start working. The domain is already bought, it has the same name as this side project: Relații cu Publicul a.k.a Public Relations. During the saga with the technical challenges of creating a complex website for Relații cu Publicul, I also developed a concept for a type of website that would serve as a platform where students could organise around matters concerning university life. My intention was/is to develop a free wordpress theme which can be adopted by anyone wishing to do so. The idea came from the wish to have a sort of ”institution” without anyone being actually in the position to have to direct the whole thing. Returning from the residency and a short trip to collect some publications, I managed to talk to a couple of people who had been engaged in artistic interventions in public space. Learning from them and the publications, I got the idea to create an intervention that would focus the attention of both sides, the students and professors, on the issue of the garden. 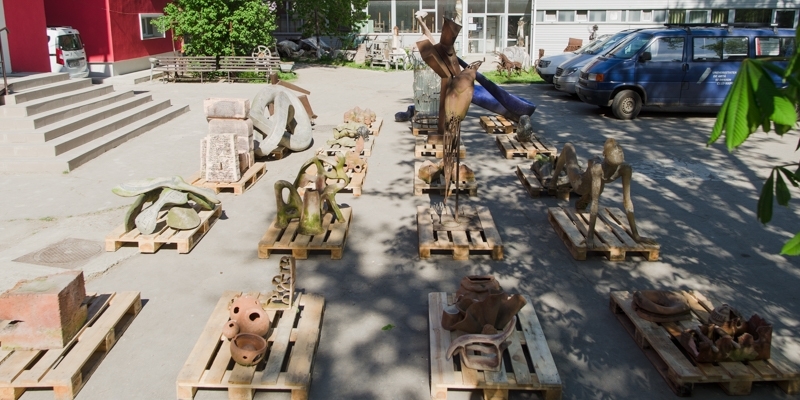 On a Sunday afternoon every sculpture, that could be moved, had been placed on these EUR pallets. On Monday morning, the professors were confronted with their parking lot being occupied. The action and me had obviously been met with hostile reactions by the professors with cars. On one hand, these reactions were somewhat righteous since through this action very clear value judgments had been stated. 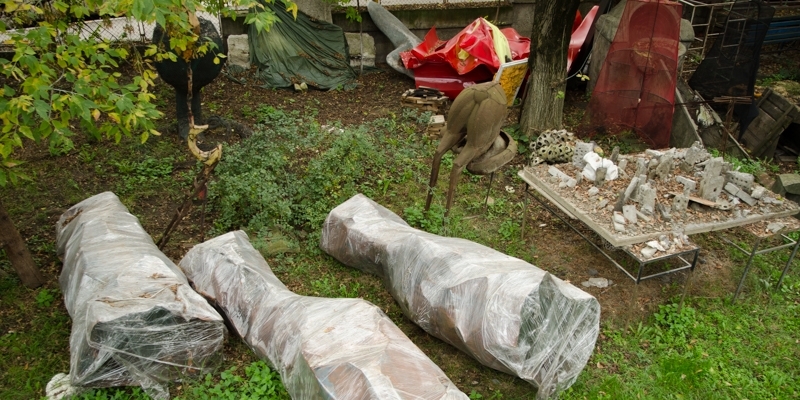 On the other hand, the action revealed the qualities of these sculptures, because they were taken out of the green spaces that hid them; furthermore, ”large” green spaces had become vacant, showing what had been only the matter of talk up until that moment. 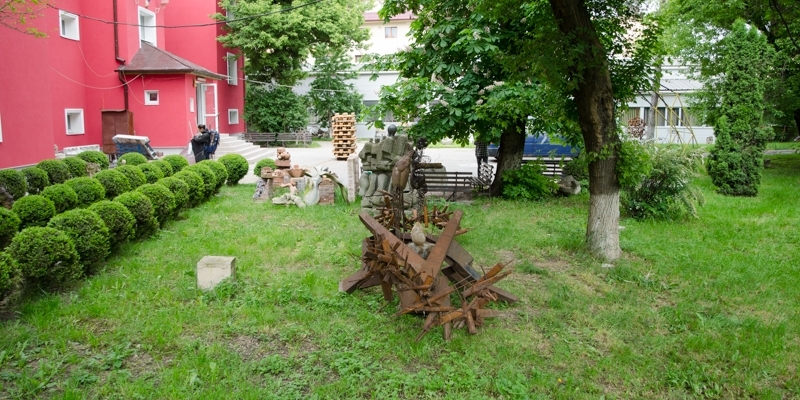 At the end of the day, the sculptures had been regrouped, occupying much less green space, while the EUR pallets had been arranged into a sitting area near the entrance of the university. 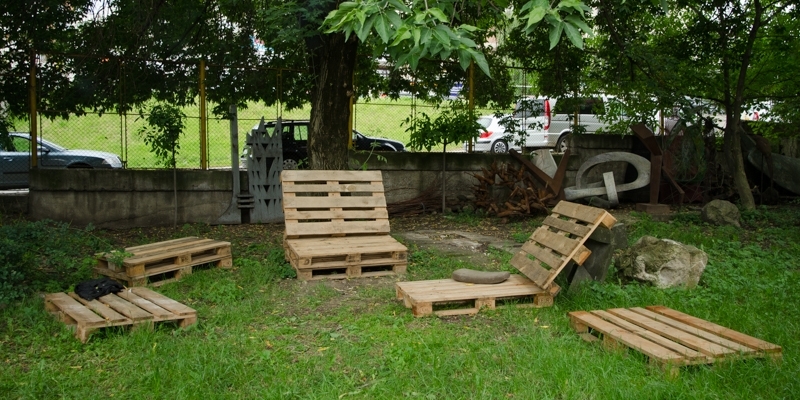 The next day, when things got back to normal and the professors saw the sitting area, they agreed to let the pallets stay and see how the space evolves. If it proves to be useful, further plans could be developed and taken into consideration by a big budget masterplan which would transform the whole garden. 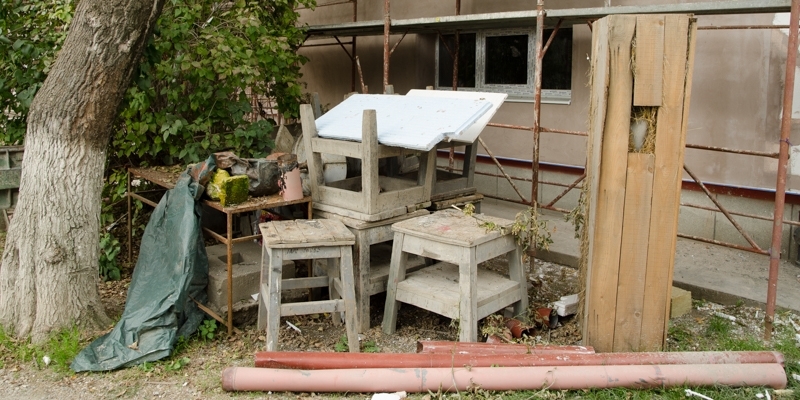 That same next day, the professors ordered the students to clean the workspace in front of the sculpture department. things got back to normal. After the place had been set up, I started spending more time talking with other students. It was during these cigarette breaks, that a lot of ideas came out and even though there had been no diary to gather them all, these formed the outcome of the project. Stories started to spread through the grapevine, many of them being outrageous examples of how things went inside the university. The abundance of stories, of which I am sure that I had only heard a small fraction, gave the idea to do a publication called the ”Student's Guide”, where these stories could circulate. Another idea was to incorporate this as a platform for discussions into the wordpress theme that was mentioned a bit earlier. A few weeks after this action, I went on another trip to collect the rest of the publications from Timișoara, Bucharest, Iași, Chișinău and Cluj. 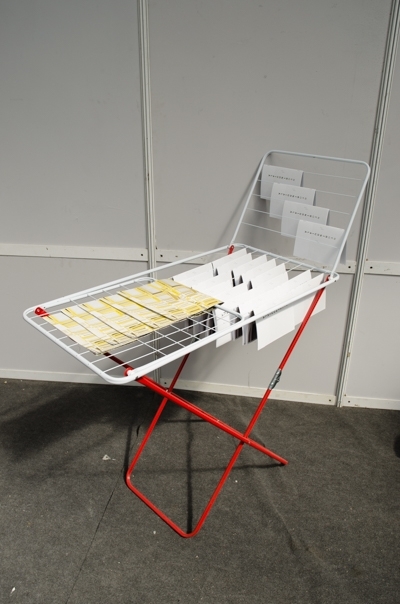 Returning from the trip, I decided to organise an event for presenting the publications, arrange a meeting place with the cheapest available materials and collect funds for a student from the fashion department so she can produce a few hammocks for the university garden. All this while cooking food, similar to a VoKü, but called Kantin, something I have been fortunate enough to do with a couple of friends the previous year. Unfortunately, my professors didn't even want to hear about this. They were very angered by the ”occupy parking lot” action, and also because there had been some bacchanalias in earlier years, which due to unwanted incidents had been stopped from happening again. So I decided to stir things up again. 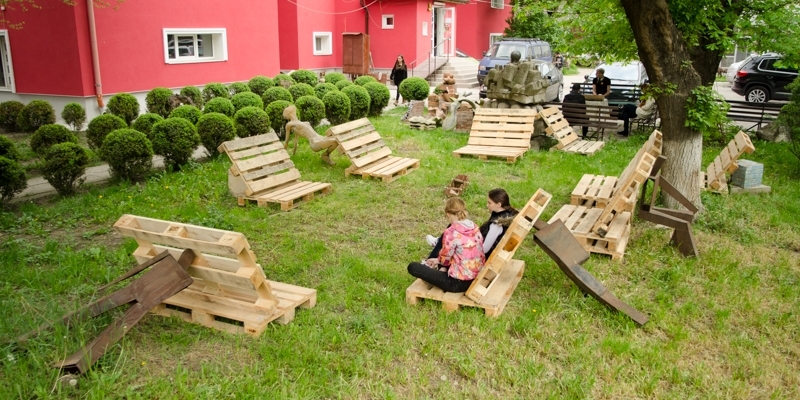 The pallets had been in place for one month, the meeting place proved to be useful, but people were already getting too comfortable with it. 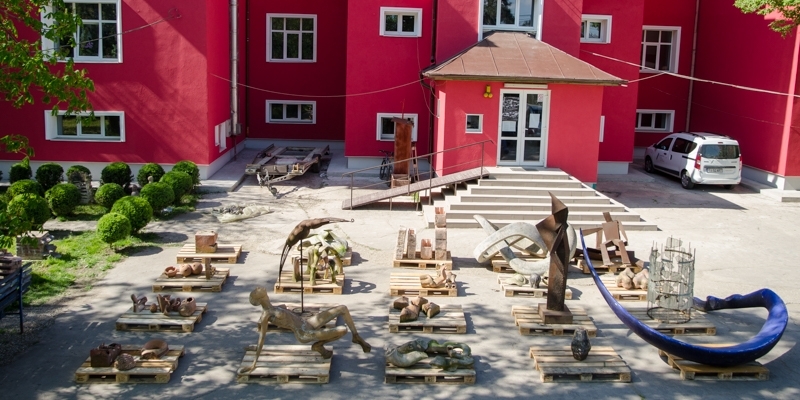 The pallets were gathered and piled up at the entrance of the school, replaced by all the metal sculptures, that could be found in the garden. 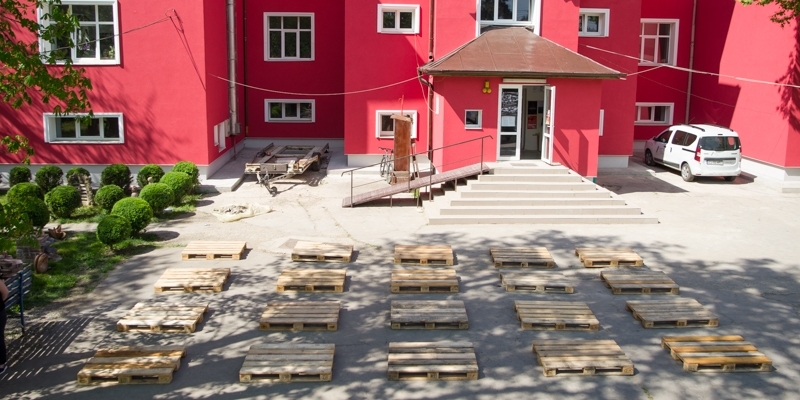 The idea behind this little action, which again unsettled the professors who thought I was through with provocation, had been to see if students would dare and take the pallets to arrange them in any space they wish. Furthermore, I wanted to see which spots in the garden they would choose. Now, at this point, I think I made a mistake not communicating calmly enough with the professors, since these tiny actions were just play and nothing serious from my (and many other students') point of view. Even though I am still very convinced that my provocations of questioning authority were not insulting, threatening and especially not as serious as an eventual series of political debates on the University Charter, on student rights or professors' obligations and ways of enforcing them, nor leaking outrageous stories in pamphlets, the very fact is that communication between the professors and me had come to a dead end. 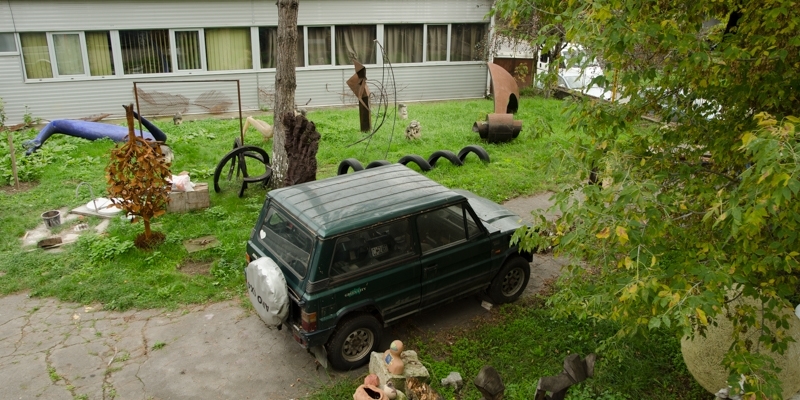 Many of the student works out there had been placed in the garden by the professors. In an abstract way, they do not belong anymore to the student but to the professors who had prepared the student and had chosen her/his work as a representative of a certain style, of academic curriculum. My theory on why these actions had been and still are considered insulting is that the professors of sculpture witnessed the ”displacement” of academic orientation, the abolition of a locally canonised type of formalist sculpture, they maybe even envisaged the coming of a new world order. One needs to look at the heated public debates every once in a while a controversial political persona gets a public sculpture, or is removed from public space. With this action, the idea arose to continue the project on another path, instead of a dogmatic and didactic cultural political agenda. 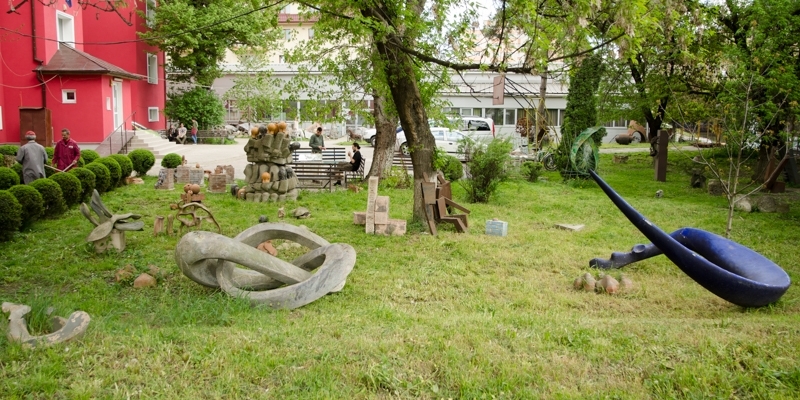 The other path could have been a set of carefully designed, humorous and ironic but not too provocative actions, that would have started to play with the physical space of the garden. Unfortunately, this action had been received as the last drop and it was very difficult from that moment on to engage in any discussion with the professors. However, the students and even other professors, who were annoyed by the mess in the garden, voiced their support...but only in person. 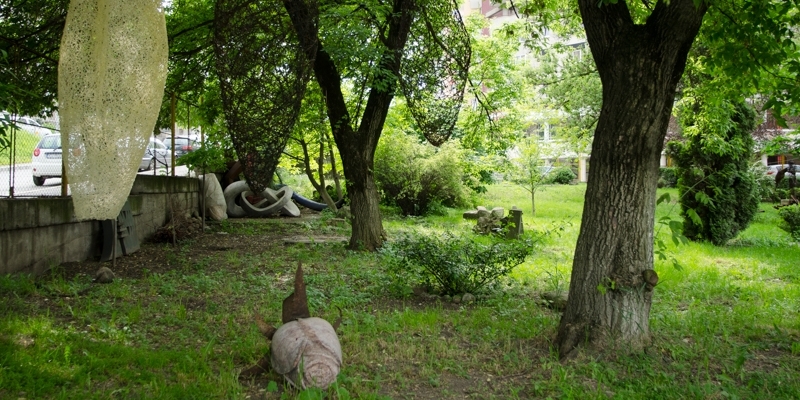 And there is no way to find out if professors from the department of fashion or ceramic/glass had been putting pressure on the department of sculpture, once they had seen how could the garden look like. photo: the only place the students had arranged, right across the red building. 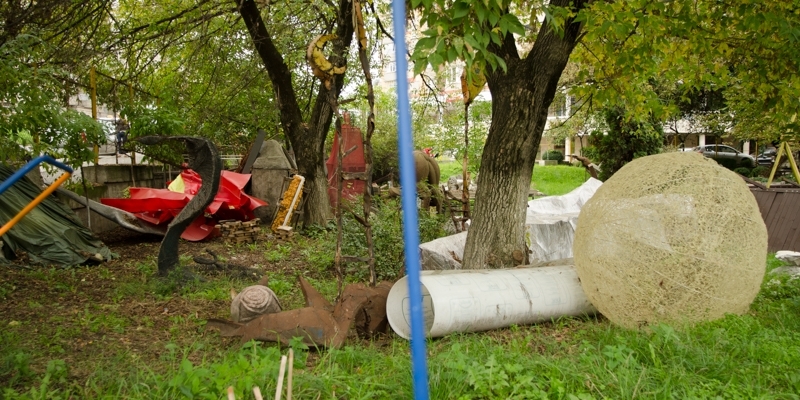 The garden got a bit more clean and a bunch of deteriorated works had been thrown away. It was still quite tempting to put the remaining works right in front of the department of sculpture, under the window of the professors' room, but any further action would have simply generated unnecessary conflict. 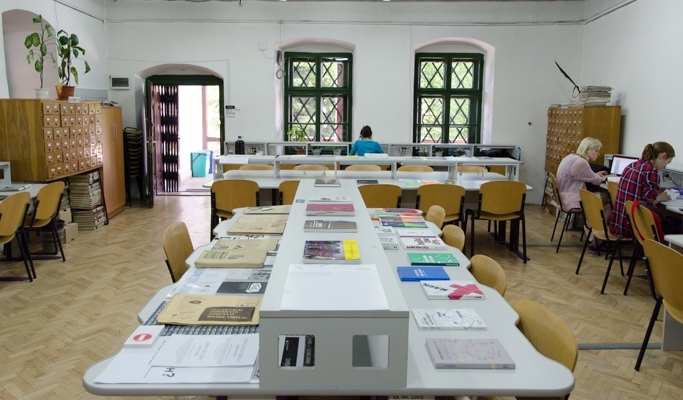 On 6th of June, towards the end of the year and the diploma project, the collection of books and publications had been presented at the university's library, under the exhibition title Public Relations. 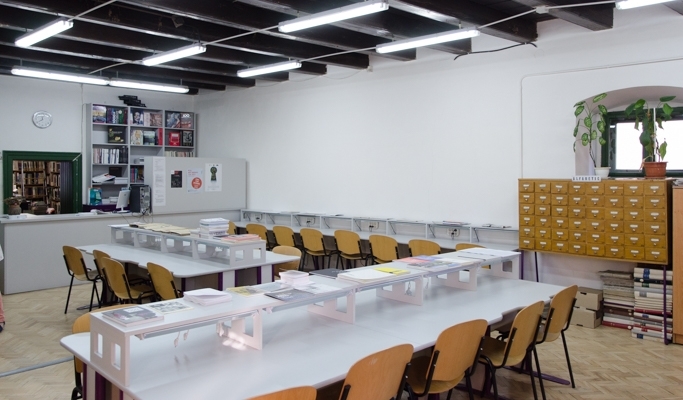 Initially, I wished to present and then leave the books inside the department of sculpture, in a room which until 2016 served as a computer room. It became a deposit afterwards and since communication between the professors and me didn't have a friendly tone, I did not get approval to clean that space and arrange an independent library. During the presentation of this independent library's plan to the professors, it has been proposed by them that everything could be donated to the university's main library. This meant a dilemma: should the books be donated to this library and let them "disappear" on the inaccessible shelves or should I find another institution that could provide another type of visibility? 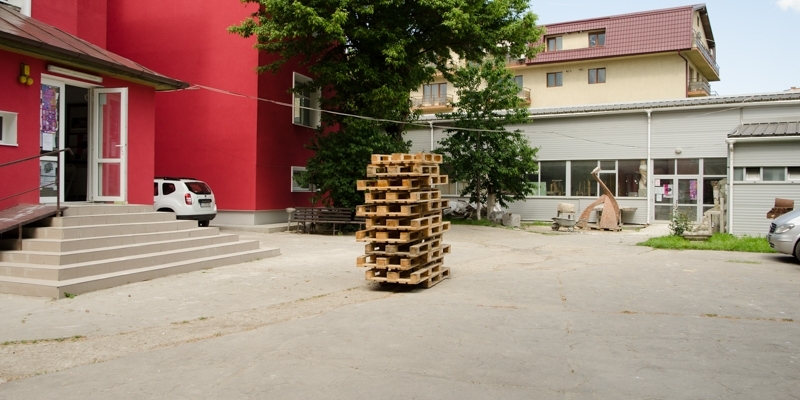 The latter was chosen, and the collection had been incorporated into a larger collection of books at the Tranzit House in Cluj. 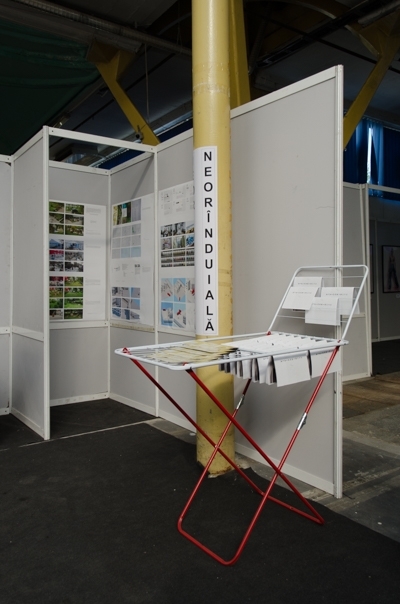 View of neorînduială at the diploma exhibition in Expo Transilvania, Cluj. A couple of pamphlets that had been spread out during the process. These panels illustrated the process from the beginning until the open ending. 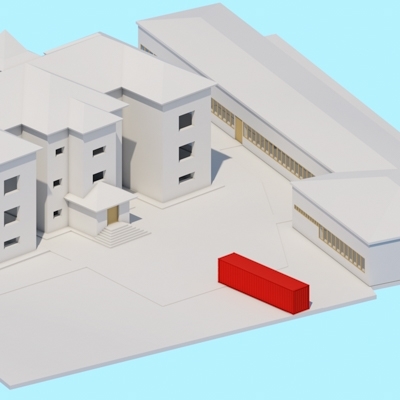 Still a proposal, the idea of placing a 12.036 m x 2.438 m container inside the academic space is the result of half a year of consultations and discussions with the students. Occupying the respective surface, the functional space doubles. 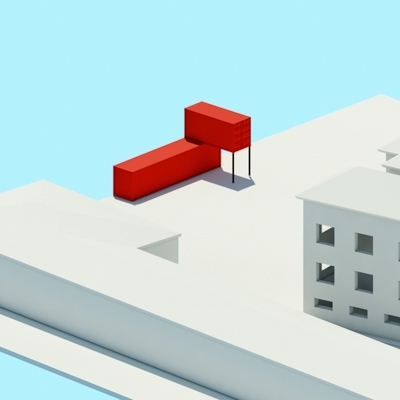 Parts can be cut out, being replaced by glass; external covers can be attached and the roof can be used; it can be elevated, creating place under it; other containers can be attached; it can be transported; it can be transformed into a cinema, gallery, coffee-house/bar, stuff-market, discotheque, theatre, smoking room, library, debating and lecture room, shopping work (workshop), ping-pong hall and who knows what else could be hosted besides site-specific projects, theatre groups, student fundraising, speaking intellectuals, creative studios, portfolio reviews, presentations about the activities of NGOs, student representatives or even students themselves. 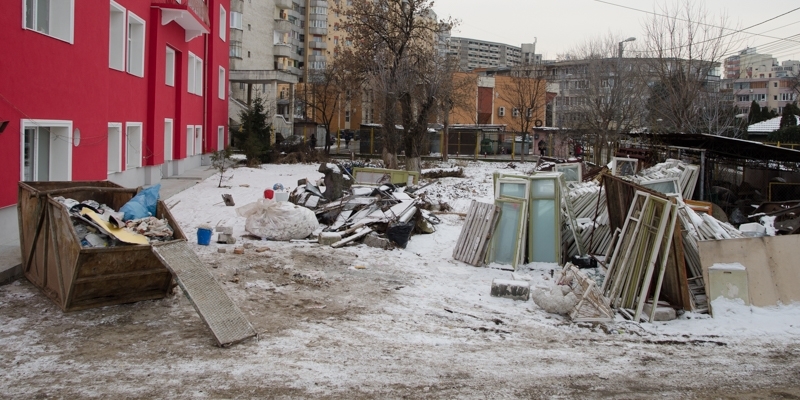 All of these without a construction permit, according to the Romanian legal system. 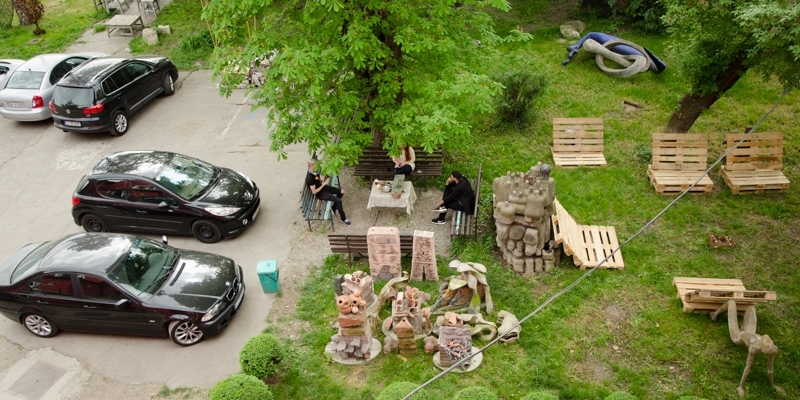 The abundance of artistic programmes taking place inside containers (not only for the reason of their multi-functionality) provides proof of yet another wish to establish a different type of institutional set-up for the fine arts. - In 2010, the artist Belu Simion-Făinaru conceptualised, curated and initiated the Mediterranean Biennale in Haifa, Israel. 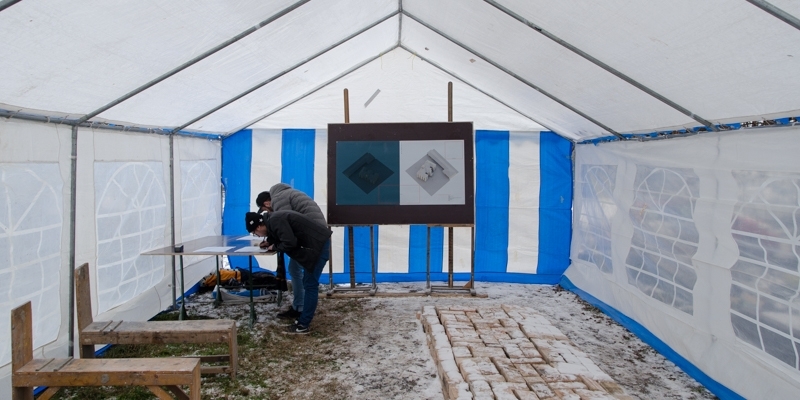 Its first two editions had been held inside containers placed in public spaces. - The Nomadic Museum designed by Shigeru Ban, had been built entirely out of containers, serving as a transportable and ecological structure. - In Kaohsiung, Taiwan, the Kaohsiung International Container Arts Festival is already having it’s 8th edition. - In Friedrichschafen, Germany, the Zeppelin University created a temporary platform called ContainerUni, specifically designed for alternative methods of knowledge production. It was inaugurated at the beginning of 2013 and dismantled in 2016. - A moving exhibition named Contain[era] had been initiated in 2015, traveling in eight containers between Prague, Bratislava, Roma, Zürich, Berlin and Vienna. 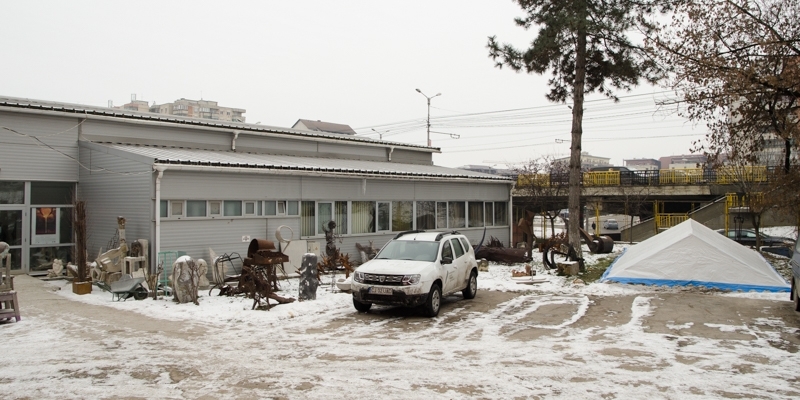 - Following an international call for projects in 2015, starting with 2016 seven artists will participate in the residency called Container Artist Residency 01. The program takes place on the vast routes of commercial cargo ships, with exhibitions presented in more than 20 cities. The list of wishes, suggestions and proposals coming from the students clearly shows the necessity of a space independent of the academic orientation or of other cultural institutions from Cluj. This would not mean the platform’s isolation from the university. On the contrary, it’s concept relies on unconditional collaboration with this institution, being also open towards other domains. 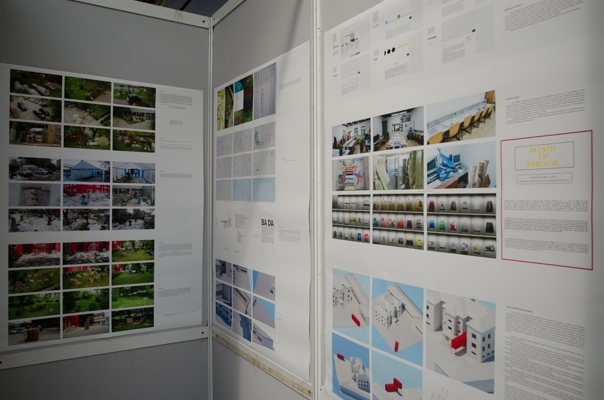 The presented proposals form the totality of the diploma work and in a way these also mark it’s first chapter. The programme is extremely vast and complicated, and might be idealistic, but not impossible. Initiating and establishing its programme depends on socio-cultural, political and economic factors, which on the one hand had been criticised in the dissertation. On the other hand, these were outlined by the intention to highlight certain questions, without which such a project could take an undesired turn.